heavy restrictions on welding, metal shearing and other fabrication tasks. As part of a thorough Front-End Engineering (FEE) stage, EPIC took the client provided lab-scale test data and process flow diagram (PFD) and developed the piping and instrumentation diagrams (P&ID’s). The design of the distillation pilot plant went through at least five major revisions during the front-end engineering phase, with Akermin and EPIC collaborating as a team. Iterating through the range of desired pressures and temperature profiles within the distillation columns is an example of one of these collaborative changes. Akermin’s budget could not absorb the cost of building columns capable of the temperature ranges and pressures originally proposed. By narrowing these profiles to the critical range that could prove scalability, EPIC helped Akermin reach a pilot plant size that was suitable in budget and technical capability. Using stainless steel tubing was suggested by EPIC’s distillation experts. Tubing is faster to install, costs less and the process systems operational parameters did not require piping. EPIC does in-house TIG welding, but it was collaboratively decided to use Swagelok tube fittings instead of TIG welded construction for cost and time advantages. Sight glasses were added so Akermin could visually verify flow within the columns. A lifting plan was developed during FEE. Crane size & placement, shipping method and skid size were pre-planned by EPIC and approved by Akermin before fabrication moved forward. The lifting plan also thoroughly examined the path to ultimate resting place at the utility plant, ensuring the skid dimensions fit through any constrained spaces. An absorber column where CO2 is captured using potassium carbonate solution. Stainless steel tubing and compression fittings instead of TIG welded piping to reduce unnecessary spending. Environmental concerns are pushing utility plants and other manufacturers to find a cost effective way to reduce CO2 emissions. This pilot plant process is testing an experimental new technology for CO2 removal from power plant flue (or exhaust) gas . Ninety percent removal of CO2 at the power plant test site is required to deem the technology a success. Akermin’s technology integrates a special enzyme within proprietary, permeable polymer films to create a Biocatalyst Delivery System. This System can be used to accelerate CO2 absorption for a wide range of amine solvents or salt solutions. For this pilot project, Akermin elected to test the biocatalyst with potassium carbonate (K2C03) solution and apply the polymer film to structured packing. CO2 removal efficiency, biocatalyst rate enhancement, and optimal operating envelope are all parameters Akermin is testing with this pilot plant. Lean potassium carbonate solution trickles down from the top of the absorber column and flue gas rises from the bottom. A fan helps blow the flue gas upward and the columns operate under a slight 1.5 psi pressure. 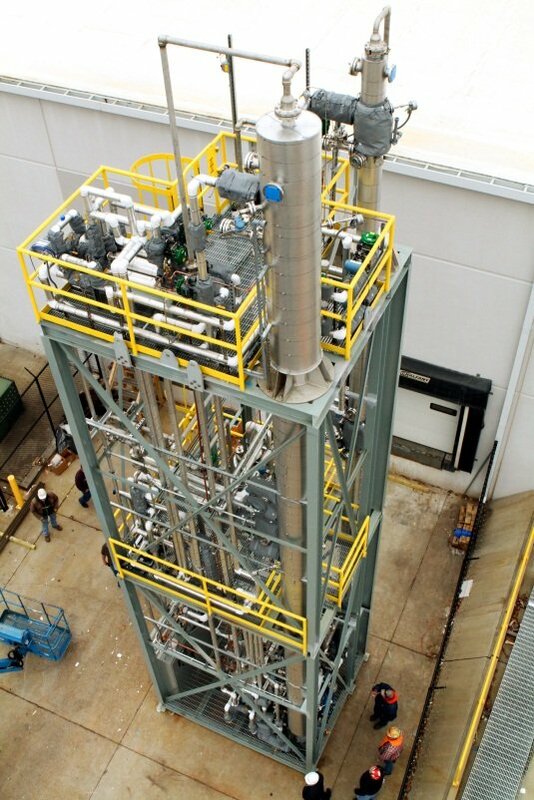 Rich solution , aka CO2 infused potassium carbonate, is removed from the bottom of the first column and introduced into either the top or middle of the stripper column. Steam from a re-boiler rises from the bottom of the column and strips (or separates) the CO2 from the rich solution. CO2 and steam rise out of the column as distillate and the lean solution is circulated back to the absorber column and picks up more CO2. CO2 laden steam is condensed and the CO2 sequestered in a holding tank. Water condensate is sent to the re-boiler and turned back into steam. Small amounts of fresh potassium carbonate are periodically added to the constantly circulating solution. Akermin is testing the location of the rich solution dump into the second column. The higher in the column solution is introduced, the greater the temperature required to complete distillation. Energy savings may be achieved if the solution can be dumped mid-column and still realize the goal of 90% CO2 removal. Structured packing is used in the columns. Akermin has completed baseline testing using blank (non-treated) packing. This packing has recently been removed and replaced with identical packing that has been coated with Akermin’s biocatalyst delivery system . EPIC designed the column to allow for packing change-out. Two removable steel structural sections can be detached from the distillation skid to give access to the columns and packing. Distillation column specifications and skid layout for the distillation pilot plant required two weeks of engineering design work. The pilot plant’s footprint was designed to be small, but a lot of equipment had to fit onto the distillation skid. Material introduction and removal is achieved within tight areas between packing. A large quantity of instrumentation was mandated by Akermin because the distillation system is a test module. Placement to prevent interference with each instrument was crucial. Probes, nozzles and valves were carefully placed between layers of packing & distribution plates and correctly oriented for operator and maintenance access. CO2 concentration is checked through a series of sample ports at the bottom of each packing set. Liquid flow through the columns is verified through sight glasses. Temperature transmitters give live feeds for the temperature profile in each section of the columns. Distributors were placed between each layer of packaging to collect liquid moving down the walls of the column. The liquid is re-routed by the distributors to the center of the column, before passing through the next layer of packing. A DeltaV DCS control system was programmed, installed and tested. Equipment and controls were functionally tested before the pilot plant skid was shipped. Akermin was closely involved throughout pilot plant assembly, fabrication and testing. They completed at least a dozen walkthroughs. Akermin’s knowledge of their process technology and EPIC’s knowledge of modular distillation systems complimented each other and created a successful distillation skid. This is a typical example of the client supplying the process technology and EPIC Systems, designing and fabricating the most capital-efficient, fastest time-to-market implementation of that technology. The “plug-and-play” skid was installed at the utility plant smoothly and plant process & utility connections made painlessly. Modular skid design provided a major advantage to the client. Power plants have many dangerous elements and heavy restrictions in place. Welding, metal shearing, or anything else that could potentially cause a spark, is exceedingly difficult to orchestrate in a hazardous area. Scheduling work around power plant operations would have proven difficult and costly. A modular skid allowed the distillation plant to be built in a safe and timely manner. The pilot skid was delivered fully operational, and installed with minimal down time for existing operations. Visit our Advantages to Modular page to learn more about why EPIC advocates a modular approach to most process systems. Find a better solution. Contact EPIC or learn more about industrial distillation systems, pilot plants or other modular process systems.